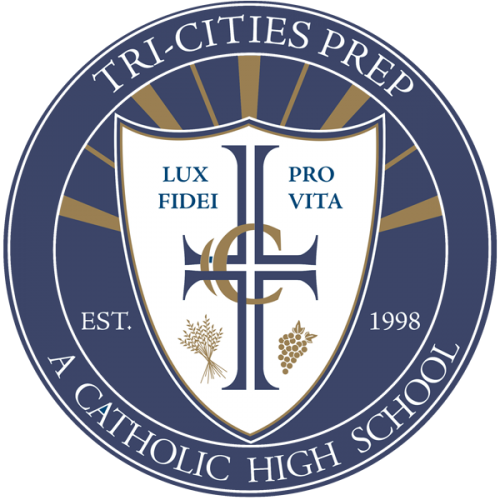 The St. Thomas Aquinas Chapel at Tri-Cities Prep was dedicated in May of 2015. Today this sacred space is the centerpiece of our school. When the north wall of the chapel is open to the multi-purpose room, the entire school community can come together for our Eucharistic celebrations and when closed, the chapel becomes an intimate space accommodating one or two classes. 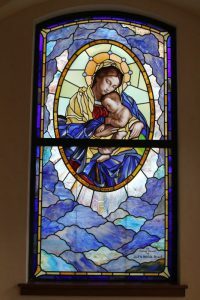 Architect Tere Thornhill designed the chapel to not only be versatile, but to also reflect the radiant beauty of fifteen stained glass windows created by world-class artist, Patrick Clark. Artistically trained in Vienna, Patrick grew up in Richland, and has integrated themes and materials into the windows that reflect the unique natural beauty of eastern Washington. Incorporating magnificent designs with gems and other elements, the entire perimeter of the Chapel of St. Thomas Aquinas reflects Catholic tradition and tells the story of the life of Christ in brilliant stained glass. Tri-Cities Prep’s chapel is not only a gift to our school, but to our entire community, and we are grateful for all who sacrificed to make this exquisite, sacred space a reality.